This weekend was a busy one in the garden! The weather was sunny, although with a fair amount of wind on Saturday but Sunday afternoon was very pleasant. This time of year is always exciting. Gardening activities are resuming in earnest and a lot can be done to prepare for a great gardening season. On Saturday we began working on the Spring Hill Children’s Garden. It’s the first of its kind here in our town. We’re combining it together with a community garden and a farmer’s market and because of the amount of interest that has already been generated I’m sure it will be an exciting project! We managed to get a portion of the garden marked off and a gathering area cleared for kids to listen to gardeners and for various project activities. I’ll highlight more on the children’s garden later. On Sunday I picked up my tiller from a friend of mine who is skilled with small engine repair! The last time I attempted to run the tiller not only wouldn’t it start but I broke the pull string. That was a frustrating day. The tiller worked great in the vegetable garden yesterday to till in a large space that was covered in chickweed. I’m suspecting that chickweed makes a pretty good green manure. I do most of my gardening in raised beds but I’ve had to remove several beds recently and needed to clear the ground of weeds before putting anything else back in that area. Winter weed grow fast when you look at them – and ten times faster when you don’t! 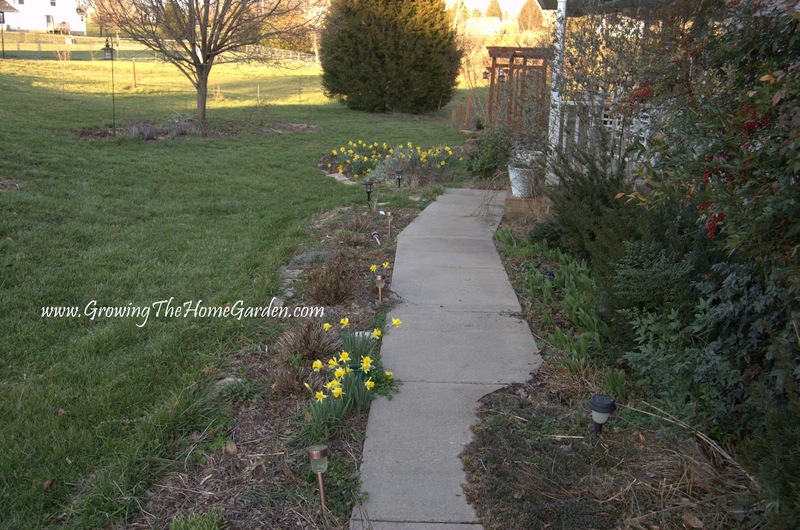 Here’s a quick look around the garden and yard so you can see how spring (even though it technically isn’t spring yet) is progressing! 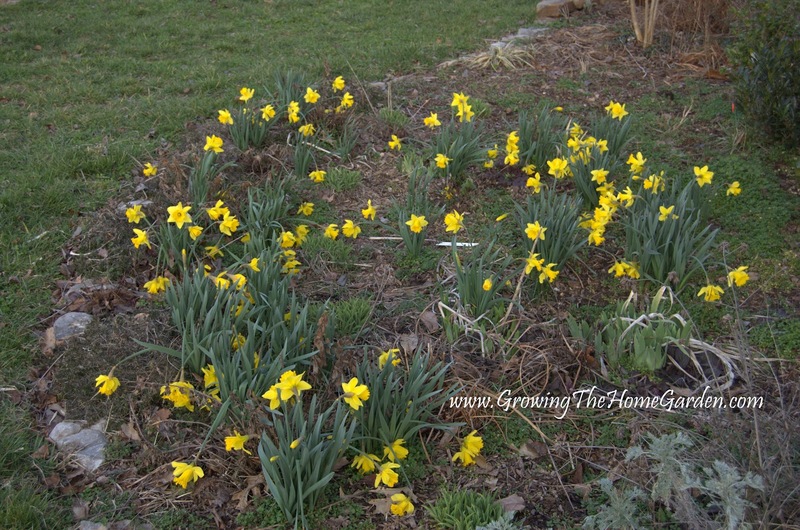 These daffodils are in the garden in front of the front porch. We call it the “Front Porch Garden.” I’m not sure where we ever came up with such a unique name… The little patches of green in the garden are from yellow re-blooming daylilies. Daylilies are sending up their foliage all over the garden right now. I weeded some weeds a couple weeks ago but many have grown back since. Weeding is a constant process! It’s definitely time to start mulching the gardens for spring. 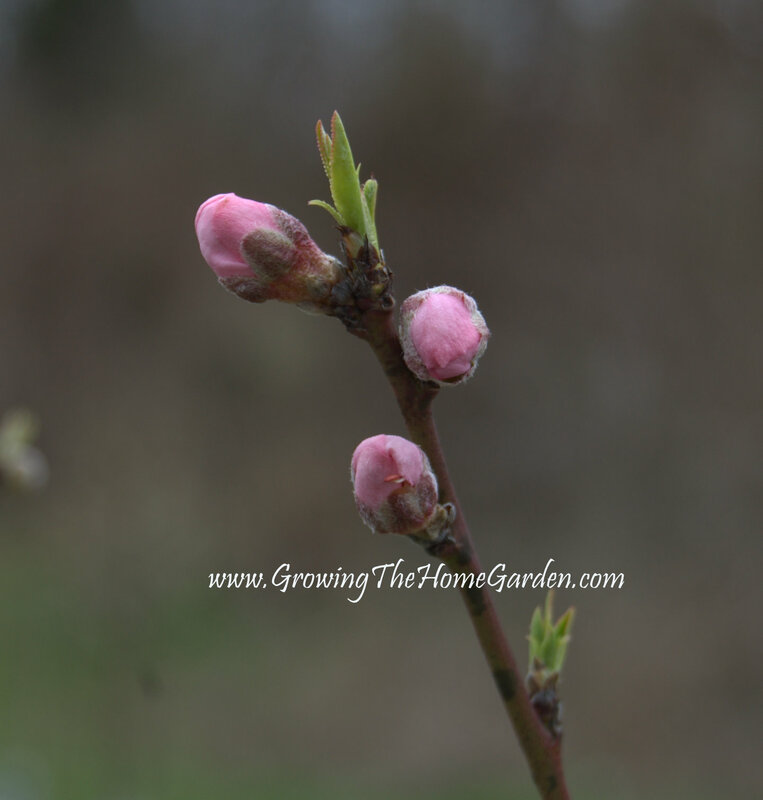 The peach tree is very close to blooming now. I’m hopeful that we’ll actually get a few peaches from it this year but I’m only cautiously optimistic. Peach trees are tricky to get fruit from without doing a major spray regimen. I may spray a couple times this season with some Bt to see if that will suffice in keeping it pest free. 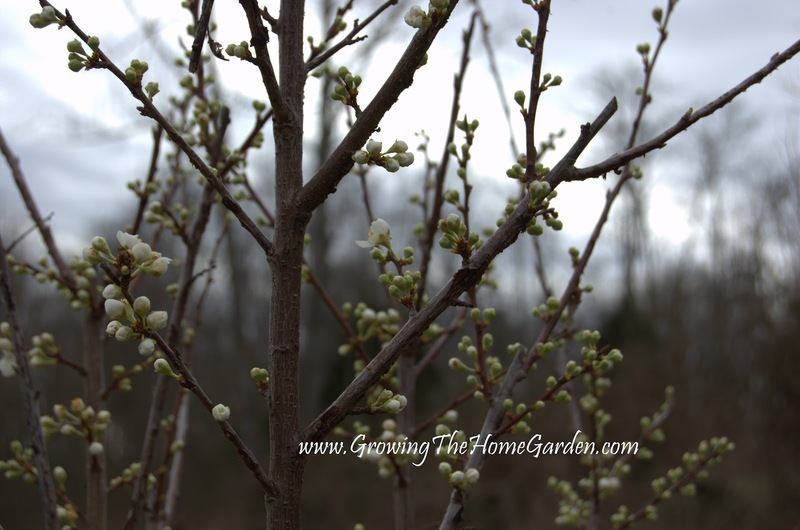 We have two plum trees planted for cross pollination and one of them has already bloomed! ‘Bruce’ and ‘Morris’ are the two varieties we have. Last year we were just about to get plums from one of our plum trees when the deer stopped by for breakfast…I’ll be covering them with mesh this year after they begin to set fruit! How was your weekend in the garden? Spent most of Saturday reorganizing and sanitizing our nursery pen for when our hens go broody. Reorganized my yard tools (hubby and sister cleaned and oiled them) in their plastic cabinets that I like to keep on the deck. Began netting the big guinea/chicken pen to try to keep starlings and sparrows from eating the poultry feed. Turned over the last of my 3 raised square-foot gardens. On Sunday I worked at Walden's Puddle while hubby and sister put up a chain-linked panel with a door in the big bird kennel. Will make herding and wrangling the male turkey and the bachelor ducks/geese much easier. I'll be visiting Charleston SC for a couple of weeks so I'll get to enjoy their spring and then our spring when I come back in the middle of March. One year I had 3 Springs – March in Charleston, April in Tennessee, and May in Chicago. What a year! Three springs sounds like fun – although a lot of travel! I bet all those birds make for a busy day – and a fair amount of manure too! Love the pics of the blossom on your plum trees. It's surprising what a difference there is in garden once blossom comes out and snowdrops (we have a lot of those in the UK) starts to bloom. 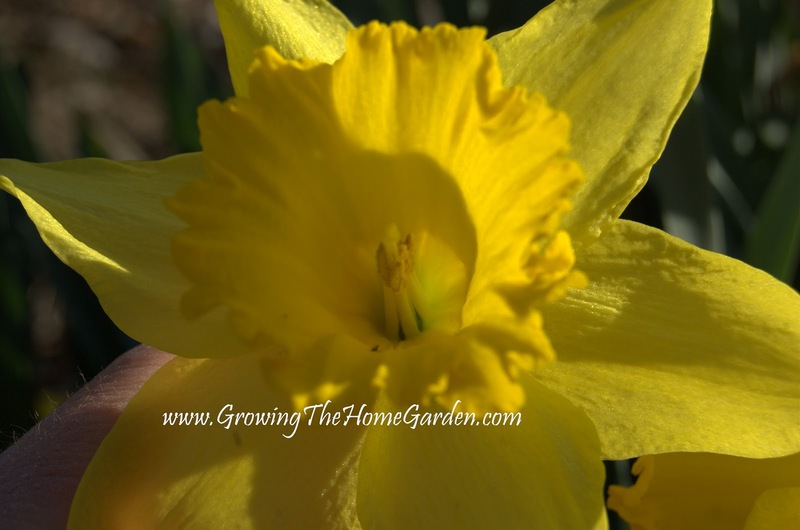 Lovely photos of your early blooms!